Please note this style runs in whole sizes only. For customers that are a half size, the brand recommends ordering a half size smaller than your normal shoe size.Whatever coast you’re on, the Santa Cruz slip-on delivers casual beach style.Canvas upper with frayed edges and side goring for a relaxed look and custom fit.Croslite insole conforms to the foot while circulation nubs stimulate blood flow.Slip-resistant and non-marking outsole provides excellent traction for solid footing.Imported. Measurements:Weight: 8 ozProduct measurements were taken using size 11, width M. Please note that measurements may vary by size. 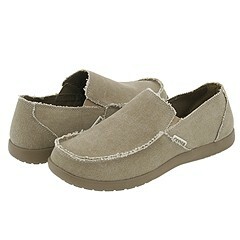 Be the first to review “Crocs Santa Cruz Men’s Slip on Shoes” Click here to cancel reply.